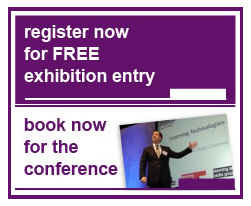 Learning Technologies 2011 – Register now for FREE entry. Learning Technologies, co-located with Learning and Skills, is now the biggest exhibition and conference in the entire corporate learning sector. It’s also the best attended and fastest growing. With more than 200 exhibitors, over 100 free seminars and an audience of 4,000 learning and development professionals, it is the must attend event for anyone involved in organisational learning.